Barrier Bungalow, Port FitzRoy, Great Barrier Island. Information, Photos and Reviews. 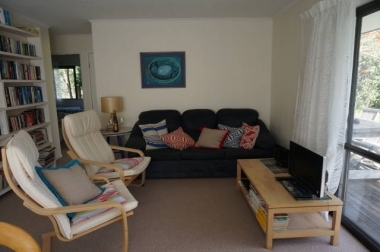 A cosy 2 bedroom bungalow at Kaitoke. Walk out the front door and you are just a couple of minutes away from a beautiful white sandy beach which is virtually unpeopled for most of the year. One double bedroom and one bedroom with 2 king singles. Linen is supplied. There is a small television and a stereo. Water is supplied from rainwater tanks and the bungalow is solar powered. Kaitoke is close to the Claris shops, laundromat and café. Perfect for a couple or for a family holiday. A short drive from the golf course and the social club. There are many bush walks in the vicinity including a track to some natural hot springs. Great Barrier Island is home to many of New Zealand's native flora and fauna including the endangered brown teal duck (pateke) and the black petrel (taiko). Woodpigeons (kereru), tui and kaka can be seen often and the regenerating forest is home to kauri, rimu, totara and many more of New Zealand's native trees. Museums, restaurants, adventure activities are all in the area. Nobody has reviewed Barrier Bungalow yet, Be the first. You are submitting a booking enquiry. Barrier Bungalow will then contact you by email with details of availability and prices.